If you think that some Wacom tablets are pretty large, then think again, because the Conoto Graphics Tablet (or sometimes called AO+ Pen Table) is huge! You can read about it at Officeoftomorrow.org. Also check out this video link. Since we’re talking about tablets; if you think the beautiful Wacom Cintiq is too expensive with a $2500 street price, then you might consider to build one yourself (if you’re pretty technical) using the guidelines on this site. How fast is your Photoshop? Driverheaven.net offers a simple way to test the speed of your current configuration of Photoshop. You can download the test here and compare your results on this page. Tests like these can be useful to find out how much hard- and software changes affect the overall performance of Photoshop. Feel free to check out related blog articles. The Light Strokes OptiPaint system is the first input device that lets you use real paint brushes and other actual artists’ tools directly with your favorite paint software. You can even use your fingers and hands, or virtually any light-colored object you’d care to paint with. 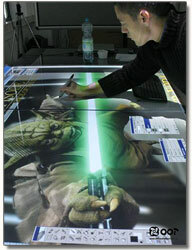 The OptiPaint system picks up the changing shapes and textures of those tools with each stroke. Up till now, the only way to get real brushstrokes into a computer would be to paint them on paper, let them dry, and scan them in. Not exactly interactive. 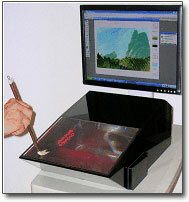 Now with the OptiPaint system, you can paint with real brushes in real time. Lunacore Photoshop Blog is powered by WordPress 1.5.1.3 and delivered to you in 0.043 seconds using 11 queries.